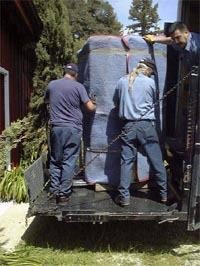 On April 4th, 2002, after almost a year of planning, Tony Cole's Cray 1A Supercomputer (#38) and prototype Cray Q2 were moved to a new home at the DigiBarn computer museum. Here these systems will be restored and documented and shared with an eager computer history community following our planned opening in Summer 2002. Here are a few images of the "load up" from the Computer History Museum's "dense storage" at Moffett Field California, and the "unloading" at the DigiBarn computer museum in the Santa Cruz Mountains about 40 minutes drive west. The whole exercise took about 8 hours starting at 7:30 in the morning. Great care was taken to safeguard these precious systems and to set them up on a new, secure pallet platform that displays them well. 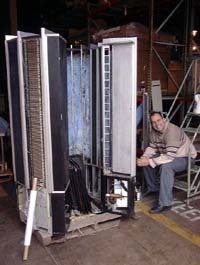 Also moved this day were the transformer "seats" for the Cray 1A, its trim, and the power distribution cabinet. We invite you to take a look below at our "Cray moving day" photo gallery. Tony Cole for acquring these systems years ago and agreeing to the move and for storage and display of his systems at the DigiBarn. Mike Zeharis (and crew) for arranging a professional and seamless move with such careful set up of these precious systems. John Toole, Dag Spicer, Chris Garcia, Mike Williams, and last but not least, Jeremy Clark of the Computer History Museum for their patience and assistance. Jim Curry for incredible insight and knowledge of the Cray systems (see his comprehensive "pole barn" Cray museum in Wisconsin). Galen Brandt, my partner in life here, for key counsel and advice on making this all work. Allan Lundell for helping to initiate the project and capture video of the unloading.